‘A typical bird of all bit the smallest waters in the county’ were the first words of the text for Coot in our First Atlas, but in the last twenty years they have spread to smaller waters and this has allowed them to extend their distribution by as many as 77 extra tetrads. The recorded habitats show 20% on ponds and 41% on small waterbodies, with 31% using meres, lakes and reservoirs; 8% of breeding Coots were on linear watercourses, mostly canals. The species is now widespread across Cheshire but Coots are missing from much of the highest land, in the east of Cheshire and in the Delamere area: they need water with abundant supplies of floating or submerged vegetation to provide the diet for themselves and their chicks. They have spread to most of north Wirral but are scarce on the rest of the peninsula, in line with the sparsity of inland waters there, and have abandoned parts of Ellesmere Port and Neston district that were occupied in the First Atlas. Since then, the national population index for Coot has risen substantially, by around two-thirds in the BTO’s general breeding bird surveys although by much less on linear waterways. The BTO analysis of the county’s BBS transects shows that the breeding population of Cheshire and Wirral in 2004-05 was 4,430 birds (2,000-6,850), corresponding to an average of more than six pairs per tetrad with confirmed or probable breeding. This is about 1.9% of the British population, showing that the county is disproportionately important for the species. 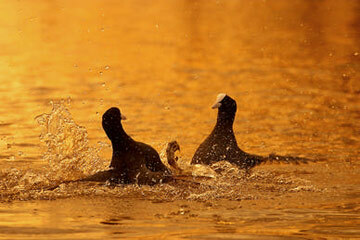 Some locations hold quite high numbers of Coots. In the last decade, at least ten broods in a year have been recorded at many of the county’s well-watched sites: Chelford SQs, Radnor Mere, Sandbach Flashes, Budworth Mere, Moore Nature Reserve and Inner Marsh Farm. High counts were 21 broods at Rostherne in 2000, at least 19 nests seen on Frodsham no.5 bed on 13 May 2000, and at least 49 broods at Woolston in 2004, the highest total there for twenty years. This is an easy species to prove breeding, with 80% of records being two-letter codes. Most of these (267 out of 326) came from observers seeing Coot chicks, but the conspicuous nature of their nests is illustrated by as many as 59 tetrads for which the highest level of proof was an adult on eggs: their bulky nest may be hidden in a reedbed, but often is clearly visible. In February or March, Coots switch behaviour from their winter flocking to become aggressively territorial as the breeding season approaches. Disputes with neighbours can turn into fights, birds using their sharp claws to strike at each other, sometimes causing injury. Most Coots do not breed until two years of age, so there can be a lot of immature birds to test the boundaries of territories. The typical clutch of six eggs, maybe up to ten, is incubated by the female for three weeks with the male nearby. The chicks start out with spiky red down and only gradually change to look like their parents during the two-month long fledging period; they are fed by their parents, who often split the brood and care for two or three chicks each. Coots usually rear only one brood, but may have multiple nesting attempts until they are successful, so the breeding season can extend from March to July. Their nests and chicks are vulnerable to predation, perhaps especially by mink: Sheila Blamire recorded the mustelid equivalent of chutzpah when she saw a mink asleep in an empty Coot's nest at Mere (SJ78F)!